Dietary supplements are popular complementary or alternative treatment options for people with arthritis. Supplements are not intended to diagnose, prevent, cure, or treat disease but they may have certain beneficial effects. The FDA regulates both finished dietary supplement products and dietary ingredients. However, dietary supplements are regulated under a different set of regulations than conventional foods and drugs. Dietary supplements are regulated under the Dietary Supplement Health and Education Act of 1994 (DSHEA). Certain supplements are recognized for having properties that help control inflammation. Let's consider a baker's dozen of the best-known anti-inflammatory supplements. Boswellia is a tree that originates in India. Boswellia extract, also referred to as Indian frankincense, is derived from the gum resin of the bark of the tree. Classified as an ayurvedic herb, Boswellia is thought to have anti-inflammatory and analgesic properties. As a supplement, it is available in pills or capsules; the usual dose is 300-400 mg three times a day. Bromelain is a group of protein-dissolving enzymes that are found in the stem and fruit of the pineapple. Bromelain has an anti-inflammatory effect that occurs when it alters leukocyte (white blood cell) migration and activation. As a supplement, bromelain is available as tablets and capsules; the usual dose is 500-2000 mg three times a day between meals. Cat's claw is derived from the dried root bark of a woody vine found in Amazon rainforests in Peru and other parts of South America. It is available in capsule form, tablets, liquid, and tea bags. The usual daily dose is 250-1000 mg. Cat's claw is thought to have anti-inflammatory properties which inhibit TNF (tumor necrosis factor), and it may stimulate the immune system. While chondroitin is a component of human connective tissue found in bone and cartilage, in supplements, chondroitin sulfate typically is derived from bovine trachea or pork by-products. Chondroitin is believed to reduce pain and have anti-inflammatory properties. The supplement may also improve joint function and slow progression of osteoarthritis. It is available as capsules, tablets, and powder. Typically, 800-1200 mg is taken daily, divided into two to four doses. Devil's claw is a perennial shrub that grows in Southern Africa. The shrub has lush foliage, red flowers, and tiny hooks that cover its fruit. It is so named because of the appearance of the hooks. Devil's claw has branching roots and shoots. The secondary roots that grow out of the main roots are called tubers. It is the roots and tubers that have health benefits, such as pain-relieving and anti-inflammatory properties, helping to lower uric acid in gout patients, and as a digestive aid. Devil's claw is available in capsules, tincture, powder, and liquid. The usual dose is 750-1000 mg three times a day. Fish oil supplements are derived from the oils of cold water fish, including mackerel, salmon, herring, tuna, halibut, and cod. Fish oil is a source of omega-3 fatty acids (EPA and DHA). Omega-3s have an anti-inflammatory effect by blocking cytokines and prostaglandins. Fish oil supplements are available as capsules or soft gels. The daily dose for rheumatoid arthritis is 3.8g EPA and 2g DHA. The seed of the flax plant contains omega-3 and omega-6 fatty acids. Some of the fat in flaxseed oil converts to EPA and DHA, the active ingredients in the aforementioned fish oil. Flaxseed is available as capsules, oil, ground meal, or flour. Capsules are available in 1000 to 1300 mg strength, but there is no typical dose stated. Ginger is derived from the dried or fresh root of the ginger plant. It has been shown to have strong anti-inflammatory properties, similar to some NSAIDs (nonsteroidal anti-inflammatory drugs) or COX-2 inhibitors. Ginger works by inhibiting chemicals that promote inflammation. Ginger is available in capsules, extract, powder, oils, and tea. Up to 2g of ginger in three divided doses per day or up to 4 cups of tea daily is recommended. Gamma-linolenic acid (GLA) is a type of omega 6 fatty acid that is found in certain plant seed oils, such as evening primrose oil, black currant oil, and borage oil. The body can convert GLA into anti-inflammatory chemicals. GLA is available in capsules or as oil. The usual dose is 2 to 3g daily. MSM, or methylsulfonylmethane, is an organic sulfur compound that is naturally found in fruits, vegetables, grains, animals, and humans. As food is processed, the MSM is destroyed, though. As a supplement, MSM has been marketed to reduce pain and inflammation associated with arthritis. MSM comes in tablet form, capsules, liquid, powder, or topical creams. The usual oral dose is 1000-3000mg daily with meals. Quercetin is a chemical that is found in various foods, including apples, onions, teas, berries, and red wine. It also is naturally occurring in some herbs. Quercetin is recognized for having anti-inflammatory properties. It blocks pro-inflammatory chemicals, such as leukotrienes and prostaglandins. Due to insufficient research, there is no recommended or usual dose. If you wish to try quercetin, consult your doctor. Thunder God Vine is derived from the skinned root of a vine-like plant found in Asia. The Chinese herbal remedy has been used to treat inflammation, joint pain, and overactivity of the immune system. In the U.S., studies are scarce, and no recommended daily dosage for the extract has been established. Turmeric is a perennial, lily-like shrub that grows primarily in India and Indonesia, as well as other tropical regions. Turmeric roots, which are related to the ginger family, are dried to a yellow powder, where it is used in foods, curries, and Ayurvedic medicine. Turmeric is recognized for its anti-inflammatory properties. It works by blocking inflammatory cytokines and enzymes. It is available as capsules or spice. The usual dose for capsules is 400-600mg three times per day—or 1 to 3 g of powdered root per day. 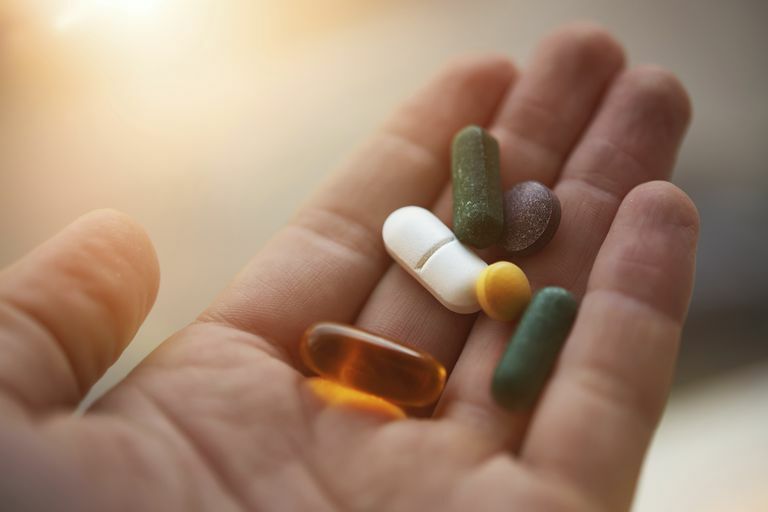 There is a common misconception that supplements are safer than prescription medications. In fact, each of the 13 anti-inflammatory supplements listed has the potential for adverse effects. You must talk to your doctor before trying dietary supplements. Your doctor will advise you about side effects and potential drug interactions. While the potential beneficial effects are deserving of our attention—so is safe use. Talk to your doctor. Primer on the Rheumatic Diseases. Arthritis Foundation. Thirteenth edition. Appendix III. Supplement and Vitamin and Mineral Guide.